My Divorce Hurt Me, Plus Others! Marriage was God’s plan from the beginning, God hates divorce and so do I. God knew that my divorce hurt! 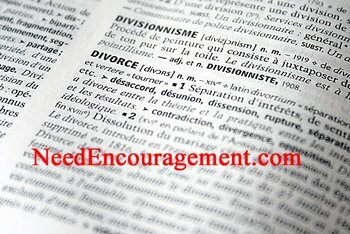 I understand the pain involved in going through a divorce; it is like the ripping of one flesh into two…Here are some encouraging scriptures about divorce. Matthew 5:32 But I tell you that anyone who divorces his wife, except for sexual immorality, makes her the victim of adultery, and anyone who marries a divorced woman commits adultery. 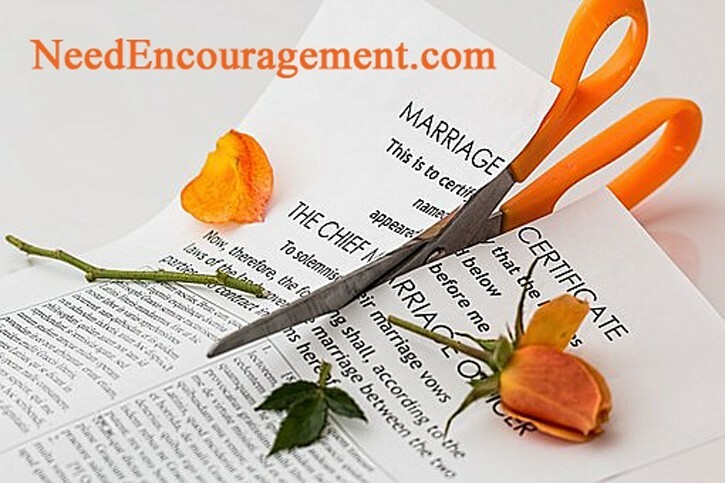 If You Have Done All You Could To Save Your Marriage? Then Turn The Page And Heal From Your Divorce! Divorce Has Gotten Out Of Control In our Society! My divorce hurt and if you get one, yours will hurt more than you could imagine, and the after mass lingers on and on. My Divorce Hurt, And Your Divorce Will Too! Two people can love each other, have a family, and then the next thing you know, they are divorced? My divorce like most other people’s divorces, do not only hurt themselves, but it trickles down to each immediate family member and their close friends. It goes further to others who knew the couple, they tend to take sides with their closer friend of the two. The only one in a divorce that benefits are the lawyers. You need to treat your partner as more important than yourself, be patient with the way they do things, always love and respect them even if you do not feel good about things, or feel like loving or respecting them. Always keep your word, be faithful, be willing to do anything for your spouse, enjoy laughter together, encourage each other, play and have fun together, work as though you are teammates, be romantic and thoughtful, pray together and stay together! Husbands do all you can do to love your wife! Divorce Hurts But God Heals Us In His Time! 1 Corinthians 7:27 Are you married? Do not seek a divorce. Are you unmarried? Do not look for a wife. How should parents who are divorcing/separating deal with child custody issues? Is remarriage after divorce always adultery? God Allowed Divorce Due To Hardening Of The Heart! God understood man’s heart, so allowed divorce even though God hates divorce! My ex and I met at the church through the singles bible study. We had dated for a year before I asked her to marry me, but we did not do much dating alone since she had a little boy we had to keep our eyes on. Chris and I got along well. I spent a lot of time with him doing things dads do with their kids. May and I did have some time to talk after Chris went to bed before I had to get back to my apartment on the other side of town late each night. But our interest in each other grew just the same. I was once told when I was going through my divorce, “That divorce is the ripping apart of one flesh into two!” Divorce hurts no matter how you slice it! Everyone is affected, the husband, the wife, the kids, the relatives, the friends, the kid’s friends, workmates, classmates, the church attended, etc. Why Do You Think Marriages End Up In Divorce So Often? Many other marriages both Christian and non-Christian end up in divorce. I am heartbroken to say that my marriage did not last like my parent’s marriage. My marriage lasted only about ten years before my wife decided she needed to move out to “find herself.” It would not be fair to put all the blame or responsibility on my ex because I had my part in the marriage too. Although I was more than willing to work on keeping us together. Unfortunately, she was not, and she gave up trying. She separated from me for two years then divorced me. Divorce was one of the hardest things I had to go through in my life. Avoid Divorce Because Divorce Hurts! Chris and I worked together on many wheelchair ramps in the summers when he was a little older. Chris used to play with the neighbors when I was working at the job sites. Just like when my dad used to work on fur coats in the basement when I was a kid. Those were good memories with my dad and with Chris. Like my dad would have done anything for me, I would have done the same for Chris. Looking back, I know that I could have been more patient, loving, understanding, and things might have been better. Although I did my best, it was not good enough for my ex-wife. It takes two people (both the man and the woman) to work together to become one in the way God planned it to be from the beginning. I was holding on for dear life itself. Being very depressed and I cried very often for no apparent reason, but inside I knew that I was crying because I was so sorrowful and that I had little strength to keep on living the way I was, but I was too scared to try to kill myself. Deep down inside I felt a spark of hope knowing that God loved me and would not allow anything to happen to me without a way up from under it. Which came true! What do you do when you feel there is no hope at all left? By April of 2006, I was so sick. I’d lost 21 lbs. I wasn’t eating right or sleeping well. I lost a lot of my friends from church and spent more and more time alone. The stress came out in extreme pains in my chest and back, and I had panic attacks. That’s when my doctor said I had a nervous breakdown, which made a lot of sense to me. I was not even a quarter as strong physically or mentally as the year before when I was working hard, playing basketball with my son and neighbors, lifting weights and feeling overall pretty good for a 45-year-old man. 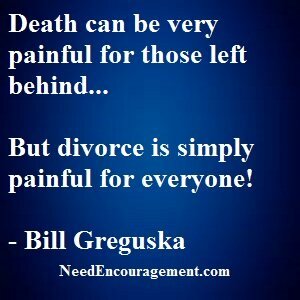 Divorce was the lowest point in my life, yet with God, He can restore the fields that the locusts have eaten. Which in time, He did! Statistics Help You Realize That Divorce Hurts! Divorce Is The Ripping Of One Flesh Into Two! Society makes light of subjects such as divorce and sin in general. No wonder the world is the way it is. Who knows where it is going without the Lord’s intervention in the lives of all of us? Divorce is one of the worst things I have ever gone through. I thank God for walking with me through it. I recommend every one of you who is married to get their lives in line with God and each other before something like this happens to you.